It wouldn't even be a chore. in the warm sunshine streaming in through the french paned window. 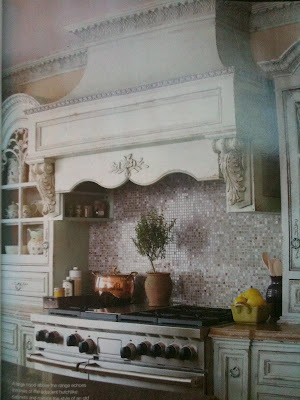 just to drool over this fantabulous kitchen. I can understand the love, sister! So, which chair am I to sit on and watch you do all of this??? I love that kitchen too, but maybe you should be speaking French while doing all that??? Sounds right! Oui oui Courtney... 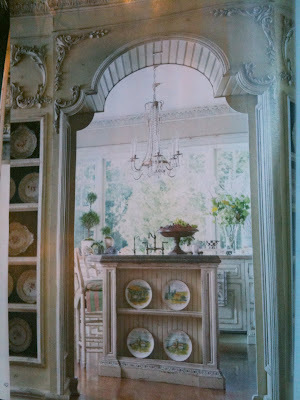 I agree, that kitchen is tres-tres belle! I want one of those too. Wuh.......*le sigh* That kitchen needs me! So funny ! 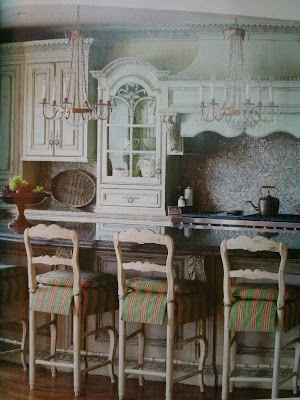 I was going to post about this fab kitchen too Courtney. 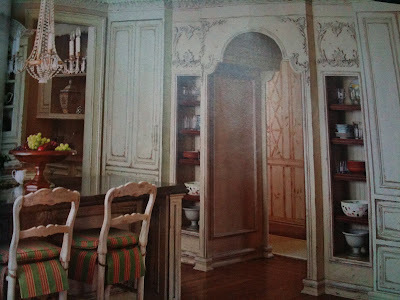 It is a Habersham kitchen, so I went right over to Habersham's website and checked out their stuff. 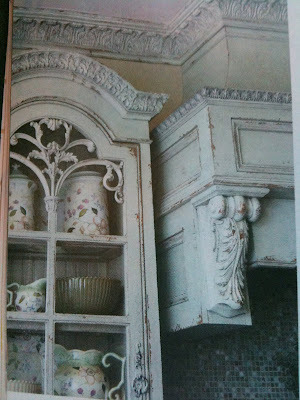 I can't believe how elegant yet distressed this kitchen is. 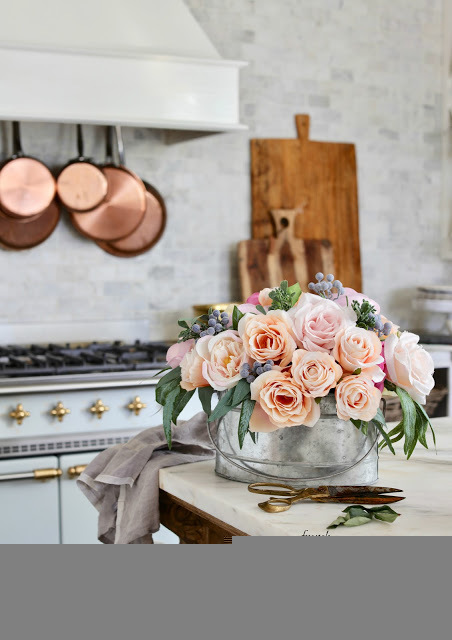 AND I am friendly with the field editor, Stacy Kunstel, of the magazine~that is where I first spotted it, on her blog of her favorite kitchens she has styled. I ran right out and bought a copy at Home Depot and came home and started plotting how I could Habersham my kitchen myself!! I am with the gals above, when would you like me over? :) It is gorgeous Courtney and I can see why you love it so!! I'm thinking that even take-out cartons would look great in that gorgeous kitchen! :-) Isn't it fun to get such beautiful inspiration? Your own fabulous kitchen looks so much like this one that I can see why you felt such a connection! Wow! Look at that detail! And the paint finish! I agree, it's gorgeous! I have to agree this is awesome. 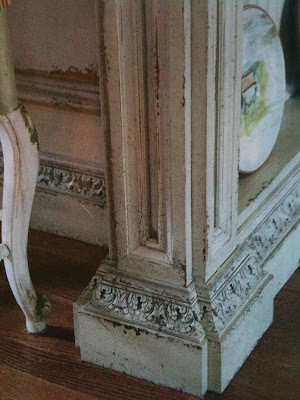 Love the pale colors and molding details. OMG...the woodwork is amazing! Absolutely gorgeous. Hi Courtney, This kitchen is gorgeous and my dream kitchen too! The range hood, cabinets, island, farm house sink...perfection! Wow! what a KITCHEN to LOVE!! Thank you girl for your beautiful visit to my soulfully French art. Your comment was a comment to treasure. You're right--this is the kitchen to end all kitchen envy. Although I adore my kitchen remodel, I agree, this one beats anything I have ever seen. Habersham really knows how to glam it up with all of the detailing but it goes beyond that with the beautiful archway leading into the next room! Absolutely incredible! I am in kitchen love!!! Oh my. 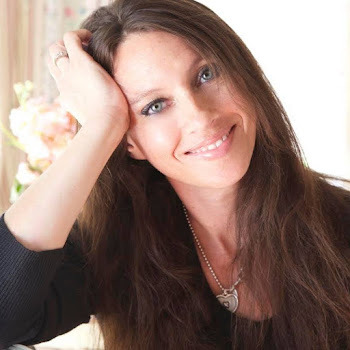 That is almost too much prettiness to bear! That most definitely is a kitched you couldn't tear me out of!!! I am going to link up to your party for the first time, very excited!!! 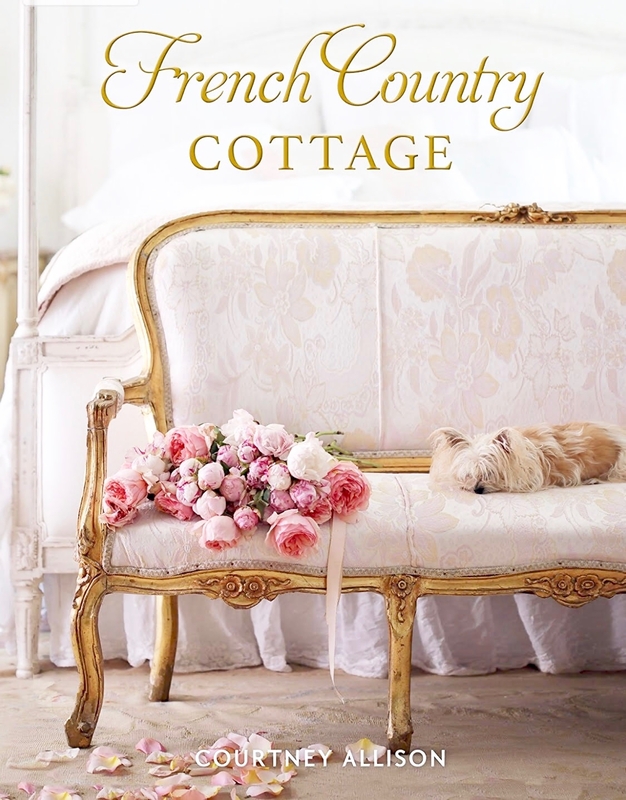 OH This is gorgeous and so French ! I would love if you link this to the French Obsession going on now ! Oh Yes, this kitchen is definitely a winner and would bring hours of "Joy to the Cook"...BUT wouldn't you have to set up a cot and sleep in there with a cookbook in hand too??? hehe! That sure is a dream! 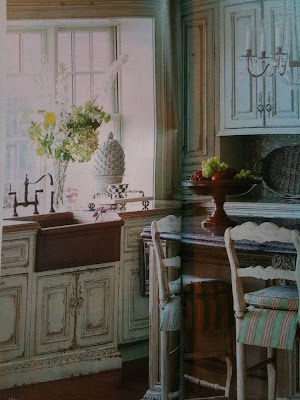 That is a beautiful kitchen, I love the pale blue color on the cabinets! Courtney how wonderful, I love it!!! A surprise coming Sunday night! It's a really lovely kitchen. Isn't it amazing the way the thought of gorgeous rooms carries the lifestyle with the rooms. 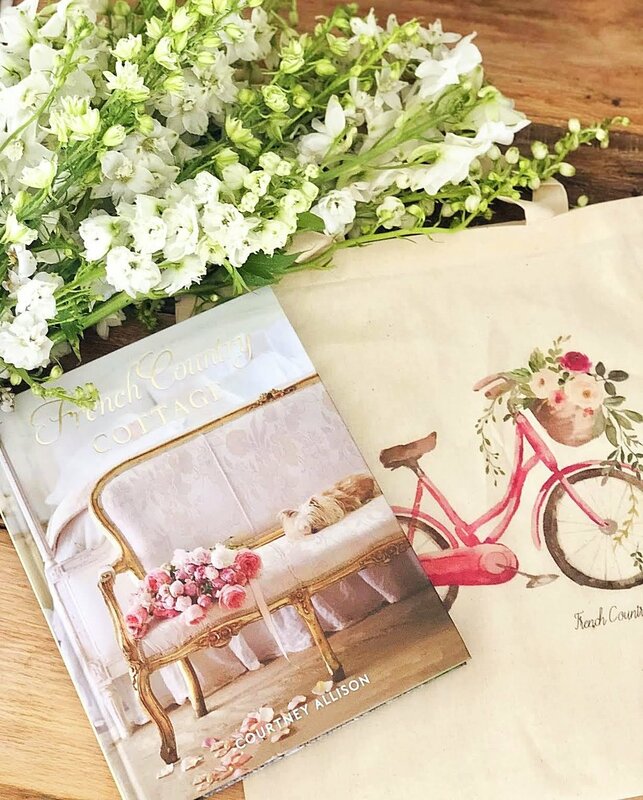 Beautiful rooms are *so* much more than just the decor. I think it's the promise of how you imagine yourself to *be* in the room that's part of the appeal. Wow, the white kitchen is beyond my dreams as a kitchen for me....thanks for visiting Mel's Cabin and sharing your thoughts. we're expecting snow tonight, we we're staying snuggled up under the quilts at the Cabin. Yep! These kitchen photos will be going in my own "dream kitchen" file! Thank you so much for linking up ! This is splendid ! all that... its very very lovely!!! I like your kitchen better than this one...yours is my dream kitchen!